I've been lurking around eBay, looking for vintage shoes. I've fed my addiction recently with 3 pairs, all former shop displays from the 1930s. These are my faves. If only I could get my foot in them! 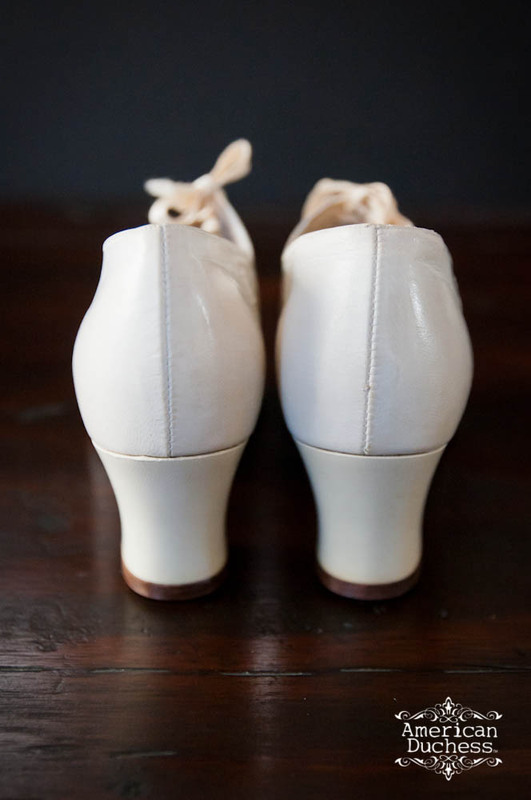 They're a size 5.5 A width, absolutely teeny tiny, but gorgeous to look at. 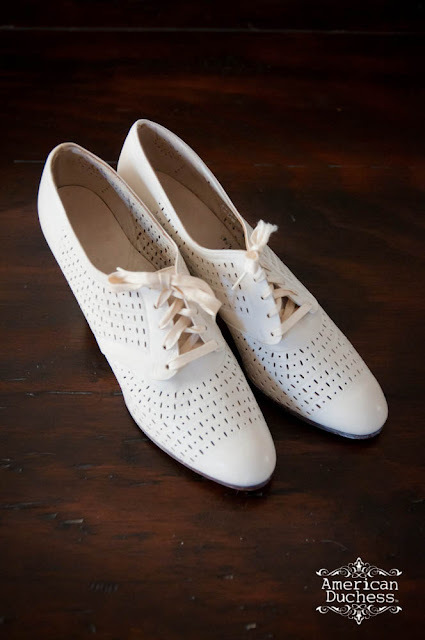 I've been looking for perforated white "nurse" shoes for so long - I don't consider them dowdy, but rather sporty, don't you? ooo yeah! They are so cute. OK -- you're really taking me back with this. 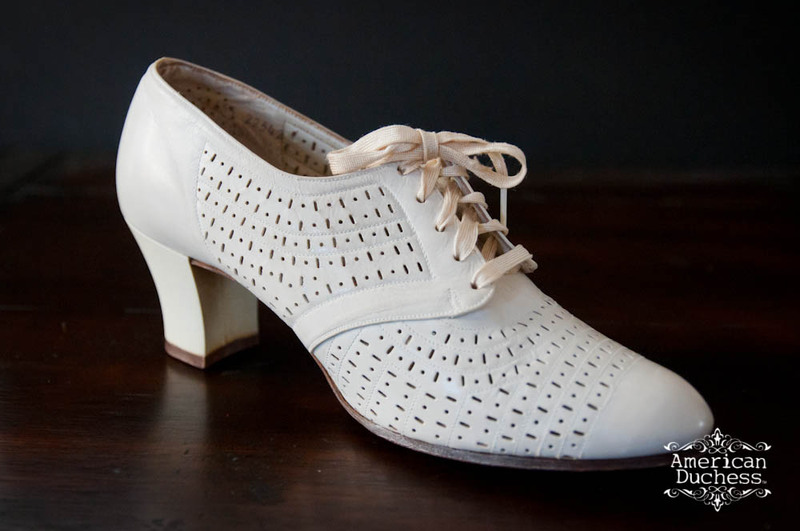 I had a 6th grade teacher in (mumble, mumble) 1963/64 who wore these exact sort of shoes (perfs and all) in May and June, but wore black versions from September through the end of April. At the time, because a) I was 11 years old and what do 11 year olds know about guessing people's ages and b) she had snow white hair and was a little bit stooped, we all thought she had to be ready for retirement, in her 60s for sure. I met her much later, when I was in college and she told me she'd just retired, that she'd finally reached the age to retire. Which meant that she was 55 when I had her. 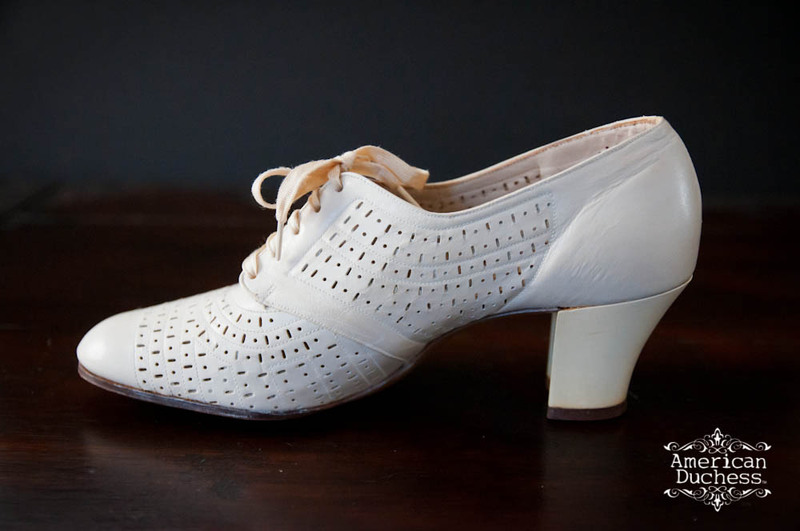 But in any case, this style of shoe was a very popular shoe for 'mature' women in the 40s, 50s, and 60s, and the white perf'd version was the summer shoe of choice. I think these would look great in black too. Your teacher had STYLE! I hope that when you say they'll return home with friends, you mean you'll be producing them, because I will buy the crap out of these shoes!!! I can't wait to see what's coming down the line! That is the intention :-) I'd like to do a whole line of early 20th c.
Oh, these are fun! They look a little like a 30's tennis advertising illustration - yes, please!!! Someone just let out the shoe fairy! I had some like this -- but with a rubber sole & heel. They were fab; you could wear them just like sneakers. 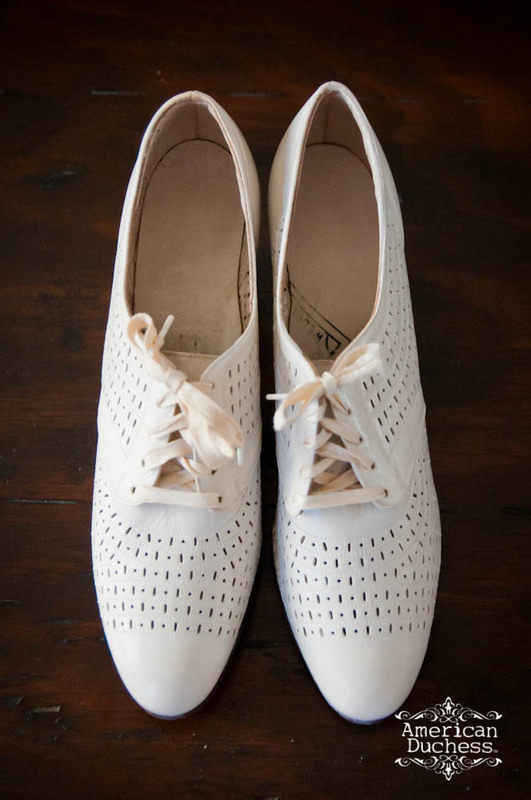 Does anyone know where I could buy a pair exactly like these?...I've been looking everywhere. I am showing these pictures to my Sunday School class because we are reading about a boy who didn't have shoes to wear to church. The only shoes in the house his size were women's nurses' shoes. He was a child in the 30s. Thank you for sharing these pictures. It will help my lesson go well! a nurse for 41 years and still working, and would buy these in a heartbeat! I had a pair of these "nurse's shoes" back in 1971. My mother received a box of clothes from the church (there were four of us kids) and they fit me! I loved them till they fell off of me :( Everyone at school asked me where I bought them. I remember they were very comfortable & wished I also had a pair in black. Oh if you could create a pair I would buy in both colors!! Crossing my fingers! !